Graduation took place on the 29th of November, and it was an outstanding event. In McEwan Hall, nine graduates and their friends and families were present for the face-to-face ceremony. 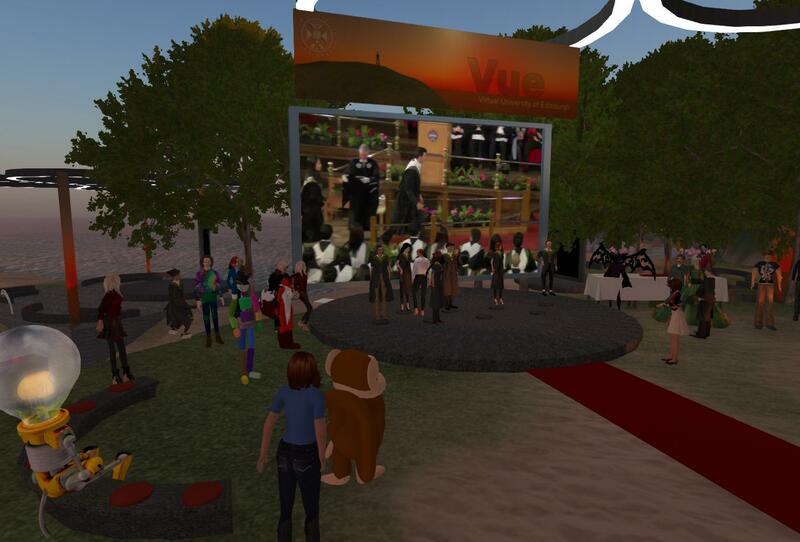 On the Virtual University of Edinburgh campus, we lost count of the number of students, friends and relations who came to celebrate with our six virtual graduates. All of us had a moment of fame as the virtual ceremony was projected live into the Hall. It was a wonderful afternoon. Thanks go out to all the graduates, and everyone who came along to support them. And special thanks to Marshall Dozier, Andy Pryde, Stuart Nicol, Fiona Littleton, Austin Tate and Angie Hunter, as well as colleagues in Registry and the Principal’s Office, all of whom played vital roles in making graduation 2.0 a success. Here are a few images captured on the day. Previous Previous post: Anyone want to run an ‘intro to Second Life’ event in February?